EPA is one of several government sponsors for the upcoming Nexus conference (January 19-21) organized by the National Council on Science and the Environment (NCSE). This timely event recognizes the intricate links between food, energy, land, and water management in today’s complex world: water supply is influenced by demands from energy and food sectors; food production requires both water and energy; and energy requires water for a large fraction of its production and delivery. Looking ahead we have several major challenges. Global population is expected to increase by 38%, from 6.9 billion in 2010 to 9.6 billion in 2050. It is estimated that with a population of 8.3 billion people by 2030, we will need 50% more energy, 40% more water, and 35% more food (source, see: “Can ‘nexus thinking’ alleviate global water, food and energy pressures?” Tim Smedley, 2013, Guardian Magazine). How do we feed the 9.6 billion people expected to be alive in 2050? What are the opportunities to improve water and energy efficiency and reduce food waste? What are the strategies for resilience in the face of increased climate variability and other environmental changes? What science and technological are needed to meet these problems? 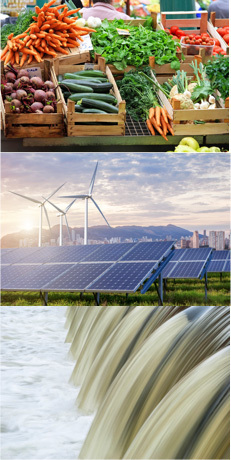 Government and business must now deal with the nexus of food-energy and water, as well as economic development, health and wellbeing and environmental protection. This means integrated, systems thinking is needed. For us here at EPA, partnership is key to the next phase of environmental protection– achieving sustainable outcomes. We are embracing research that strategically engages government-business collaboration as critical foundations for achieving sustainable outcomes. Working with our partners, we have advanced a guiding definition of sustainability as a goal and a process for meeting the challenges of the 21st century. The goal is to protect our future generations; the process involves use of technology, tools and approaches to achieve sustainable outcomes. One example is our partnership with the U.S. Army to support their Net Zero initiative, while dramatically lowering—or eliminating—energy consumption, water use, and waste generation on military bases. To support such efforts and help local communities, Agency researchers have already developed hundreds of decision support tools to assess the potential impacts of decisions and advance actions that can promote healthy and sustainable communities well into the future. For example, our recently released “Green Infrastructure Wizard” (GIWiz) provides an interactive web application connecting communities to a wealth of EPA Green Infrastructure tools and resources. About the Author: Alan Hecht is the Director for Sustainable Development in EPA’s Office of Research and Development.